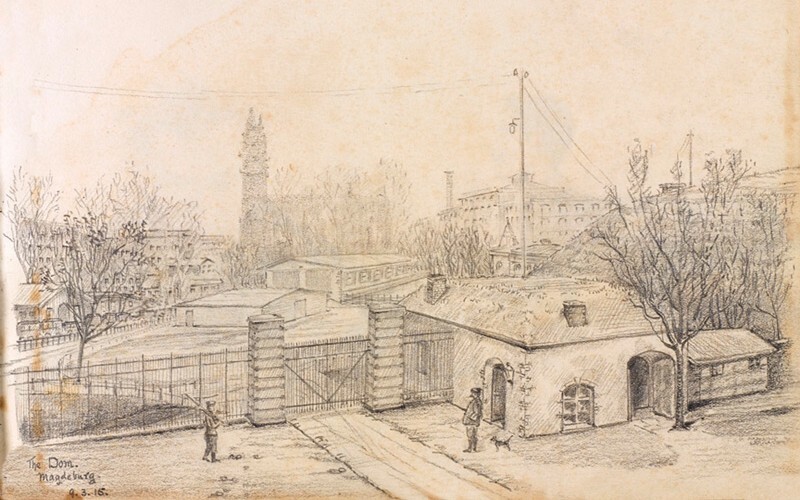 The drawings and watercolours of Lieutenant-Colonel Reginald Bond DSO provide a fascinating visual record of daily life in a prisoner-of-war camp during the First World War. In February 1915, as the belligerents on the Western Front were coming to terms with trench warfare, a British officer, Lieutenant-Colonel Reginald Bond DSO, arrived at Magdeburg prisoner-of-war (POW) camp in Saxony. 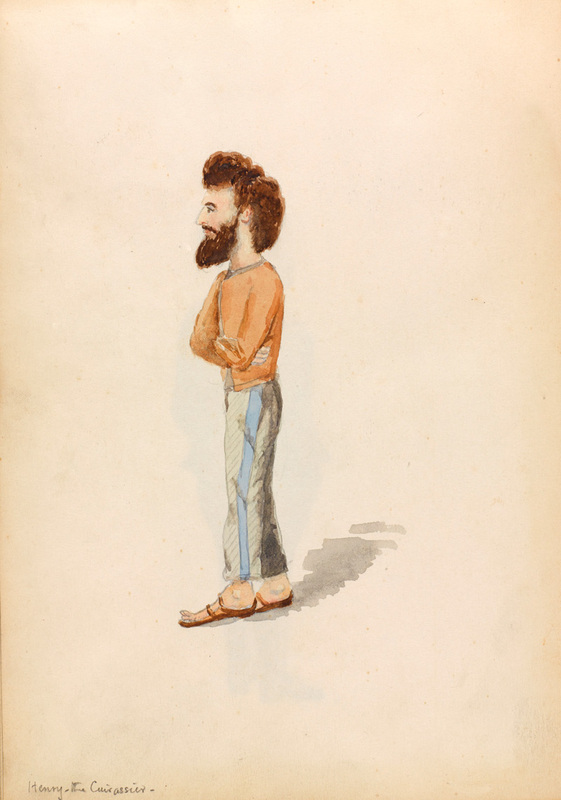 One of thousands of British prisoners sent to Germany, he soon began a remarkable series of drawings and watercolours. His sketchbook, covering the period February to September 1915, depicts his fellow British officers, along with Allied soldiers and the German guards at Magdeburg. 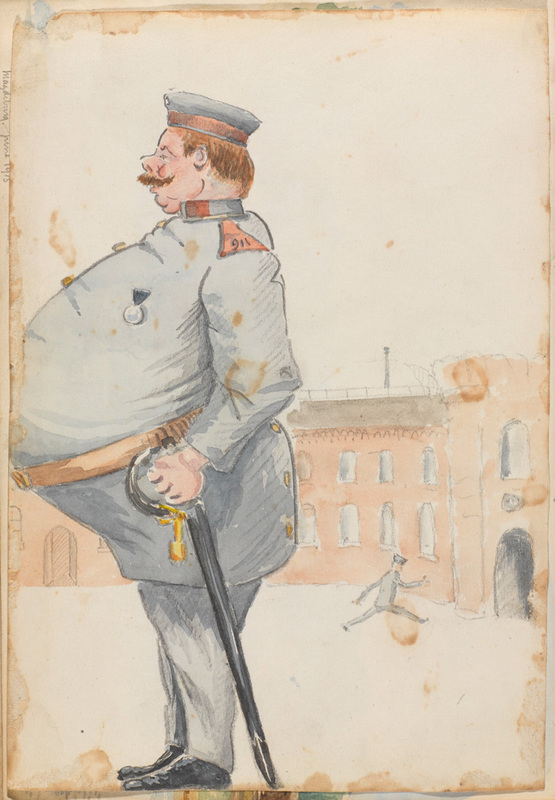 Bond’s work provides us with a fascinating visual record of daily life as a prisoner of war. To relieve the boredom and depression of captivity, prisoners took up hobbies like drawing, along with sports and entertainments. Many camps ran arts and crafts classes, or offered lectures on a variety of subjects. Officers were normally better treated than ordinary soldiers, who usually had to work during their captivity. The latter did all sorts of jobs, from farming, building roads and mining to carpentry, cookery and sorting mail. 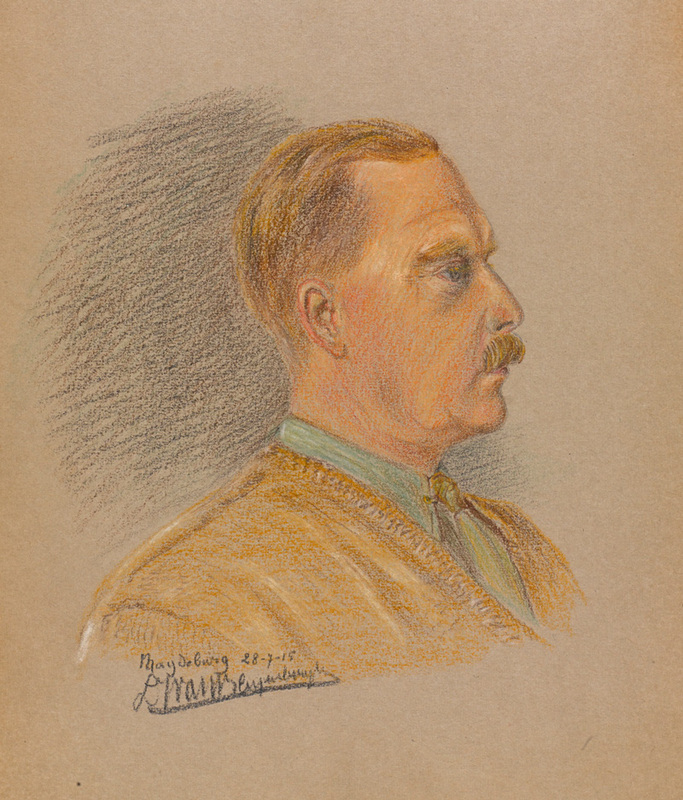 However, officers like Bond were afforded greater free time to develop their artistic talents. 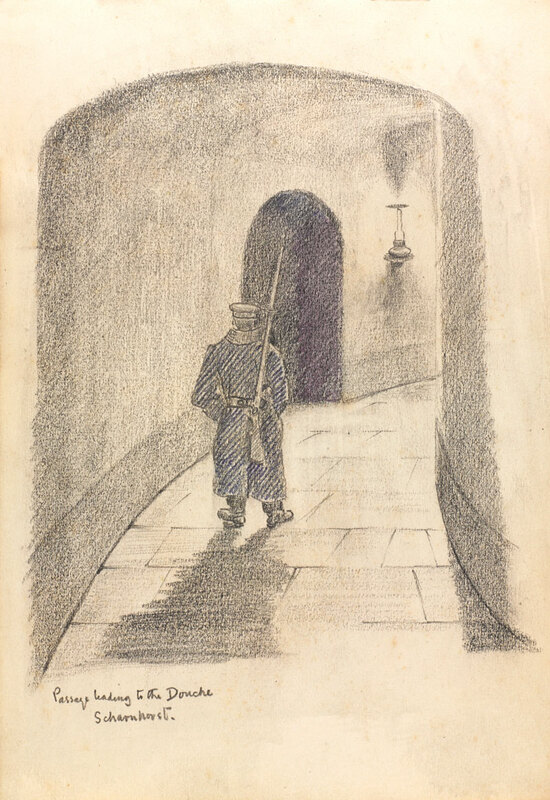 Many of Bond’s sketches and drawings show prisoners passing time by reading and writing. Relatives at home, as well as the Red Cross, sent them books and magazines. The men would share these with their comrades. There were also examples of camp newspapers created by the prisoners themselves. Letters were often the only way of getting news to friends and family. It could take weeks or months for letters to reach their destination. Prisoners and their families had to be very careful about what they wrote, as the guards could censor correspondence. 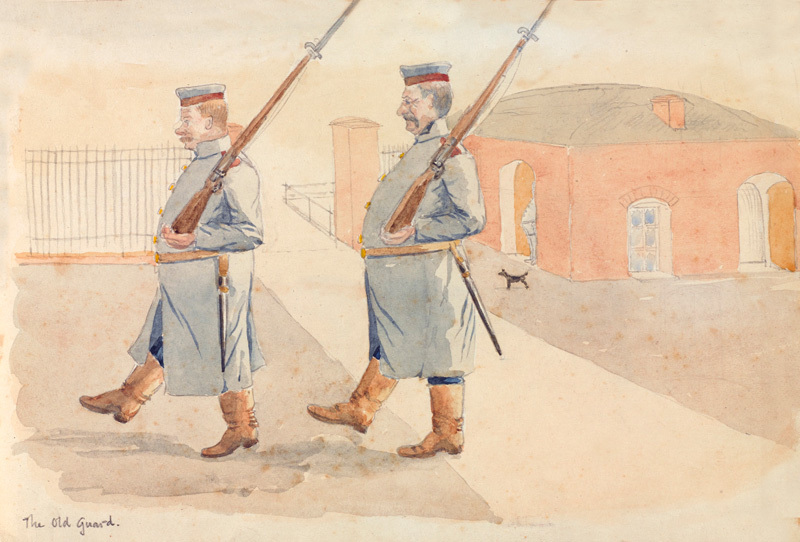 Other drawings in Bond’s sketchbook portray men resting or trying to sleep in their barracks accommodation. Some show prisoners eating their meals. Food in German POW camps tended to be very basic as the nation struggled to feed its own people as the war progressed and the Allied naval blockade began to bite. Reginald Copleston Bond (1866-1936) was born at Marlborough in Wiltshire on 28 April 1866, the son of Reverend Frederick Hookey Bond, and his wife Mary Isabella, née De La Fosse. Reginald had four brothers and sisters and his family later moved to Bathampton in Somerset. Educated at Bath College and Trinity College, Oxford, Bond was commissioned into The King’s Own Yorkshire Light Infantry (KOYLI) on 10 November 1888. He served with the Zhob Field Force on the North-West Frontier in 1890 and was promoted to lieutenant in April of that year. Promoted to captain in July 1894, he served as aide-de-camp to the general commanding Poona District from September 1895 until March 1896. In 1897 Bond married Isabel Maud Tyler, the daughter of Major-General T B Tyler, Inspector-General of Royal Artillery, India. Later that year he accompanied the Tirah Expeditionary Force (1897-98). Bond saw active service in the Boer War (1899-1902), where he took part in the advance on Kimberley, including the actions at Belmont, Enslin, Modder River and Magersfontein in November-December 1899. For his services in the campaign he was mentioned in despatches and created a Companion of the Distinguished Service Order (‘The London Gazette’, 27 September 1901). Promoted to major in September 1902 and lieutenant-colonel in May 1914, Bond lived at Carleton Park in Pontefract, Yorkshire, the home garrison of his regiment. When the First World War broke out, Bond was commanding 2nd Battalion KOYLI, which landed at Le Havre as part of 16th Brigade on 16 August 1914. He subsequently led the battalion at the Battle of Mons (23 August) and the Battle of Le Cateau (26 August), where he was captured along with 300 other men from his unit. That day the battalion lost around 600 officers and men killed, captured or wounded. Initially interred at the Clausthal POW camp in the Harz region of Saxony, Bond was moved to Magdeburg in February 1915. Soon after his capture, Bond’s sister, Mrs Preston King, received a telegram informing her that her brother was dead. His name even appeared on an official casualty list. Although a memorial service was held in his honour at Bath Abbey, Bond’s family eventually received news of his survival and capture via the Red Cross. He remained in captivity until 11 November 1918. Between then and January 1919 the majority of the 180,000 British prisoners in German hands were repatriated. Bond retired from the Army in 1919. He lived at Nethergate House in Clare, Suffolk, where he spent much of his time painting as a member of the Ipswich Art Club. He also wrote a book, ‘Prisoners Grave and Gay’ (Blackwood, London, 1935), which was based on his wartime experiences. He died on 13 June 1936.